These are the middle and rear cast steel stretchers set up for level on the bed frame - the planks are to protect the ends of the spring hanger legs. Today, we've had an in depth meeting between the CTL Seal Assembly team and the SSLC engineering team. All of the bolt holes on the stretchers, the frame plates and the frame keeps are slightly undersize. They will be reamed or drilled and reamed to size. The intention was to mount the main frame plates onto the stretchers, align and then drill/ream the horizontal and vertical holes. CTL Seal were, rightly, concerned about the drilling of the vertical frame keep pad holes. We've therefore decided to drill/ream the frame keep bolt holes and fit the frame keeps. This will ensure that the stretchers are in the correct place relevant to the axles. 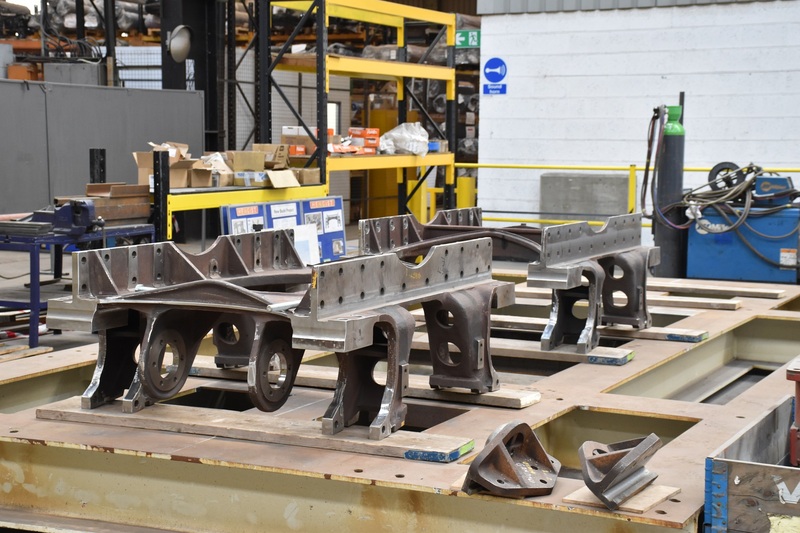 Once those have been set up the main frame plates can go into position. Therefore the next step is to accurately machine drill the holes for the frame keeps. 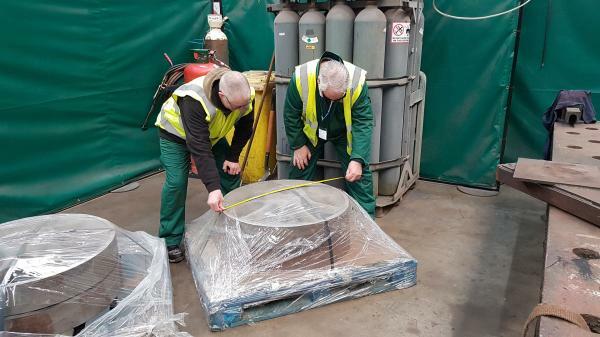 The bogie wheels have finally arrived on site in Sheffield from Boro Foundry. Continuing on from last weeks April theme, Keith and Alan apply their highly accurate measuring techniques to the goods inwards inspection!